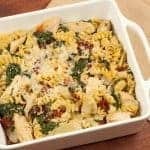 A one-dish meal made with rotini, chicken, artichokes, spinach, sun-dried tomatoes, a light white wine sauce and Asiago cheese. Cook and drain the pasta according to package directions, then set aside. Preheat the oven to 350°F and coat a 9 x 9 baking dish with nonstick spray. Remove the tenderloins from the chicken if necessary, then pound the breasts to an even thickness of 1/2-inch. Reserve 2 teaspoons of the flour for later use, then combine the rest with 1 teaspoon of salt and a few grinds of black pepper. Dredge the chicken in the flour and shake off the excess. Heat 2 tablespoons of the olive oil in a heavy skillet over medium-high heat and add the chicken in a single layer. Cook until golden on both sides, about 3 minutes, then transfer to a plate. Don’t worry about the chicken being cooked through all the way at this stage – it will finish cooking later. Add the remaining oil to the pan. Reduce the heat to medium, add the onion and cook until soft and translucent, 2 to 3 minutes. Add the garlic and continue cooking until fragrant, 1 minute longer. Sprinkle with the reserved 2 teaspoons of flour and season with salt and pepper. Cook, stirring frequently, until the flour is well blended and the mixture is pale golden in color, then stir in the chicken broth, white wine and the liquid from the artichoke hearts (about 1-1/2 cups total). Continue cooking until the sauce is smooth and starts to thicken a little, about 3 minutes, then return the chicken to the pan. Turn the pieces several times to coat with the sauce and cook until no longer pink in the middle, 3 to 4 minutes. Transfer to a cutting board and allow to rest for a few minutes before slicing into 1/2-inch strips. While the chicken rests, add the artichoke hearts, spinach and sun-dried tomatoes to the sauce. Toss with tongs until the spinach has wilted, then add the cooked rotini. Combine well, add the chicken strips, taste and adjust the seasoning if necessary. Transfer the mixture to the prepared baking dish and top with the grated Asiago. Bake, uncovered, for 15 minutes or until the cheese melts. This recipe can be made ahead up to the point where it’s baked. Cover and refrigerate for up to one day. When ready to serve, cover tightly with foil and bake for 45 minutes at 350°F. Uncover and bake for an additional 5 minutes before serving. You can also serve this dish without baking – just pass the grated cheese at the table.